Steve Riley has been one of southwest Louisiana’s premier musicians for twenty years now, getting his start with Dewey Balfa in the mid-1980’s. His group, Steve Riley and the Mamou Playboys, remains one of the world’s most influential Cajun bands. In listening to Racines, one can feel Steve’s desire to step out of the spotlight of a leadership role and into a musical circle where all members contribute equally, like roots (“racines”), to the growth of the project. With Racines he seems more determined than ever to show that music becomes more than the sum of its parts when each of those parts is allowed its full capacity. In seeking fiddlers to step as equals into this circle, one couldn’t do better than Kevin Wimmer and Mitch Reed. Kevin, another musician who got his start in the Cajun tradition with Dewey Balfa, plays with uncommon power and sings with raw, bluesy soul. Kevin also performed with Balfa Toujours and Ray Abshire. He is one of the few fiddlers who can get as much rhythm out of a fiddle as another musician might get out of a rubboard. Mitch Reed is another such fiddler. He is also known for his performances with the Mamou Prairie Band, Al Berard & Robert LeBlanc. His instantly recognizable style draws heavily on the music of Dennis McGee and several Creole players but also exhibits a swarthy funk that comes from internal inspiration alone. Mitch plays solid, full-tones bass, a skill he contributes not only to Racines but also to the well-known group Beausoleil. Chris Stafford, a founder of the group Feufollet, has been known as a musician’s musician in southwest Louisiana since before he entered his teenage years. When it comes to guitar, his primary instrument in Racines, he combines the skill and musicality of a Nashville cat with the pulse and laid-back soul of a bayou boy. His playing on both electric and acoustic guitars adds depth and heat to the music. Glenn Fields is a highly musical drummer who, like Kevin, spends much of his time on stage with the Red Stick Ramblers. He gives back meaning to the term “skins”, getting tone and feel from his drums that do more to remind us of their tribal origins than their synthetically sampled counterparts. His drumming is organic, full of dynamics that never lessen the pulse beneath. If you took all the roots of southwest Louisiana music and grafted them together, you would end up with Racines. Their music, like the roots they are names after, draws life from the nutrients abundant in the local soul. In this corner of Louisiana, that means Cajun, Zydeco, Creole, Swamp Pop, Blues and more. In Cajun French, Racines means roots, the live oak roots of Southwest Louisiana in particular. 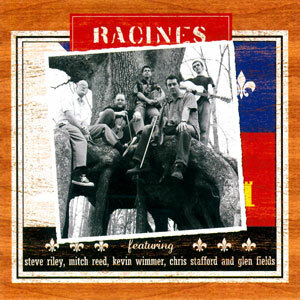 Racines, a band of young Cajun masters, draws its inspiration from the music of the region and with this fine CD presents a loving tribute to its pioneers. The quintet is comprised of Steve Riley who got his start as a teenager learning from and playing with Dewey Balfa. He now plays accordion and fiddle with his band The Mamou Playboys. Fiddler Kevin Wimmer also got his start with Mr. Dewey and along with drummer Glenn Fields plays with the Red Stick Ramblers. Fiddler and bassist Mitch Reed has patterned his playing on the fiddle style of Dennis McGee and presently plays bass with Beausoleil. Guitarist Chris Stafford, despite his young age has been a much sought after player and founded the talented band Feufollet. The selections on Racines draw from the classic Cajun repertoire but also included are Zydeco, Creole and Blues influences creating a mighty tasty gumbo of Bayou sounds. The CD opens with Sidney Brown’s “Chere Bebe” with its lively two-step mix of fiddle, accordion and steel guitar. “Gabrielle,” a Cajun waltz by Nathan Ab-shire, follows with sweet vocals by Steve and Kevin’s solid fiddle. The classic “Johnnie Billie Goat” from “Boozoo” Chavis establishes the muscular Zydeco sound. The fiddle duet of Kevin and Mitch on “Marcantel Reel/Reel de Coquin” recreates the glorious early Cajun sounds of Dennis McGee and Sady Courville. What collection of Louisiana roots music would be complete without a selection by Zydeco master Clifton Chenier? “My Baby’s Gone to Stay” has all the sweaty intensity of a night at the dancehall as the band really gets to stretch out.